This has been one of my most requested product review posts, and so i hope that it is helpful. 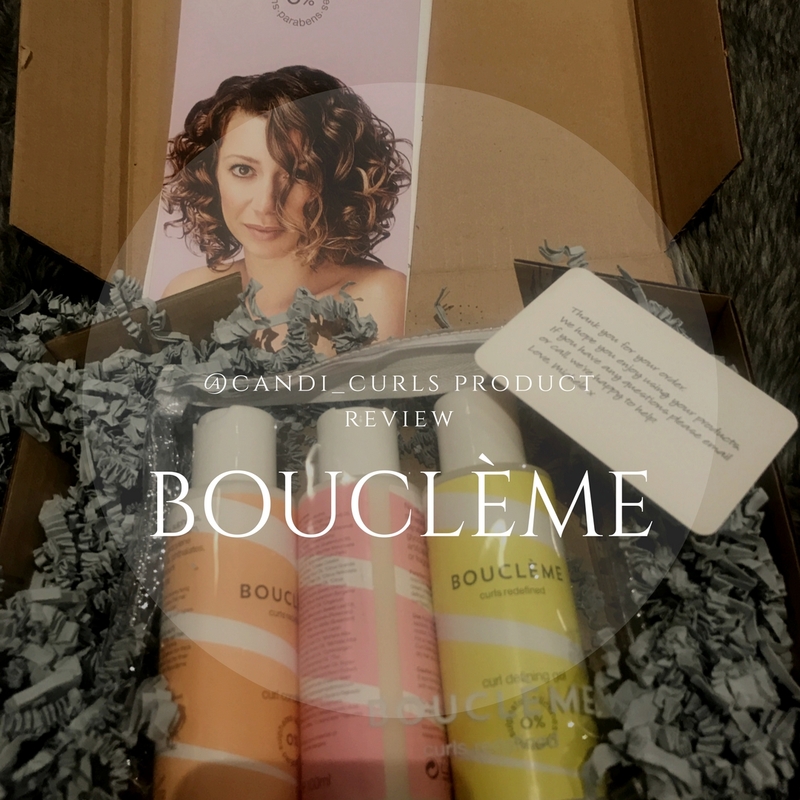 Bouclème is yet another brand that have been on my super long list, for a long long time. I first seen them in posts by the lovely @letts_curl and @iam__natasha and they had amazing results. Such shiny defined and bouncy curls i just had to try this brand out. "We understand the needs of curly hair and the difficulties managing it on a daily basis. Curly hair is drier and more fragile than other hair types. It requires nourishing and penetrating ingredients to help hydrate and strengthen the cuticle from the inside out. Our simple 3 step system cleanse, condition, define will give you beautiful, shiny and frizz free curls. As nature intended." They have a range of products all created by a curly girl, for curly girls! When i first saw this brand i actually did not know they were made in the UK and so it was a nice surprise when i finally clicked on their website, as this means no huge shipping fees for me! All these products are made with fair trade ingredients, are eco-friendly and contain no sillicones, sulphates, mineral oils, petroleum, parabens, PEGs, Phthalates, artificial colours or fragrances. No animal testing, nothing like that. The first thing that i must talk about with this brand is the packaging. It is so cute! Each product is a different coloured bottle, which not only makes it easier to pick it out of my collection, but looks great on a shelf together. Most brands have the same packaging just different names for products, so this one stands out. The colours are all light pastel shades as well meaning they fit in perfect with my colour scheme in my bedroom, and are quite girly. Due to not knowing much about the products themselves and which ones to choose from, i opted to buy one of the travel sets which contained 3 mini 100ml bottles. "This nourishing and moisture-replenishing leave-in curl cream creates soft, shiny and well defined curls. For medium and light curl types." This was the first product i tried from the set. The directions say to apply on clean wet hair, but that it can also be used on dry hair as a daily moisture boost. The first time i tried this was on damp hair (spray bottle mix) and the second time, was on dry hair. As a curl cream i didn't think much of it when i used it. Yes my curls were defined, but i felt that it didn't do much in terms of frizz. My top back section was still standing out a lot. I am not a judge-on-a-first-date kinda girl so i tried it a second time, this time rather than using it alone or with another product from the collection, i used it in my usual hair routine. The results were a lot better. The bottle does say that this is "For medium and tight curl types" and i think that my hair is not in this category. With thicker hair, i feel that it doesn't provide enough moisture to combat the frizz. Would i buy a full sized version? I am still undecided on this one. I was happy with the results i got with it, but i have other curl creams that i get better results from. "This ultra moisturising conditioner penetrates the hair cuticle leaving curls super hydrated. Perfect for all curl types." The instructions on this one are to apply to soaking wet hair after cleansing and comb through. It can be left in for thick curly types or rinsed out for finer wavy hair. The first time using this i left it in and i wasn't happy with the results at all. Something about it just didn't feel right. I think it felt more like a rinse out conditioner on my hair than a leave in. The next time i tried it, i decided to mix it in my spray bottle mixture instead. This had a much, much better result for me and is how i have been using it. If you follow me on instagram, you will see that i have been getting to day 6 curls and only refreshing with this water mix on day 4, and so this method for me really works. Would i purchase a full size? I think that because of how i am using this conditioner, a 100ml bottle is enough to last me a while and so i think i would purchase it in this size again, but not a bigger version. I am still yet to try this as a rinse out conditioner just because of how much i like the results of using it in a spray bottle. "This smoothing medium hold gel gives all day frizz control and incredible curl definition." For this gel the directions say that you should rake it through wet hair in sections and the gel will dry firm. Once fully dry scrunch to release soft bouncy curls. I would say that if you are looking for a gel that gives you a strong hold, this is not it. If you are looking for a light gel then this is the one. The hold that this gives your curls is nice and subtle. My hair didn't feel crispy and because i only applied a little, i didn't need to SOTC (scrunch out the scrunch) like i have done with others. I applied this one using the praying hands/smoothing method. The results? I LOVE it! Texture and result wise, i would say that this gel is very similar to bouncecurl, so if you tried that and loved it, then you will love this one. My curls have been so soft, defined and put since using this gel i honestly can not get enough of it. Would i buy a full size? YES! Send me a litre bottle anytime. Out of the three in the set this is by far my favourite and i am patiently waiting for the 300ml bottle to be back in stock on their website, because where 100ml has lasted me ages due to how much i need, i just don't want to ever run out of this one. The biggest thing i must mention about this brand, is the scent. Now obviously they state on each bottle, on the card that comes with it, and on the website, that they do not use any artificial colours or fragrances. This means that the product is not perfumed. Most brands add this to their products to give it that tropically smell, this one doesn't. I'm not saying that it is a bad smell, it just takes a while to get used to. To me it smells more floral than the fruity scented products which fill my shelf. Definitely hints of lemon and lavender. I am really glad that i purchased this set from them and got to try 3 products before buying a full sized version. If you would like to do the same head over to their website now by clicking here. I can not wait to try more from them and get my hands on a giant gel! Follow the brand on instagram and don't forget to subscribe and comment below if you have tried this brand. Here is a video showing all three products being used in my hair routine. The curl conditioner is mixed in the spray bottle, then i apply the cream and follow it up with the gel. I got to day 6 curls with these products!!! What are you waiting for? Go get some!! I got the 'Moisture must have' travel kit which cost just £23.